CML AT, founded in 2015 in Saint-Petersburg, Russia, specializes in the implementation of additive technologies in mechanical engineering, civil aviation, medical, instrumentation, robotics, oil and gas and consumer goods sector. The company develops and designs products and structures taking into account the features and benefits of additive technologies. Recently, Triton Bikes, a custom titanium bicycle and unicycle frames producer based in Moscow, Russia, approached CML AT with a potential project. Triton was interested in redesigning the rear yoke for its latest bike model. 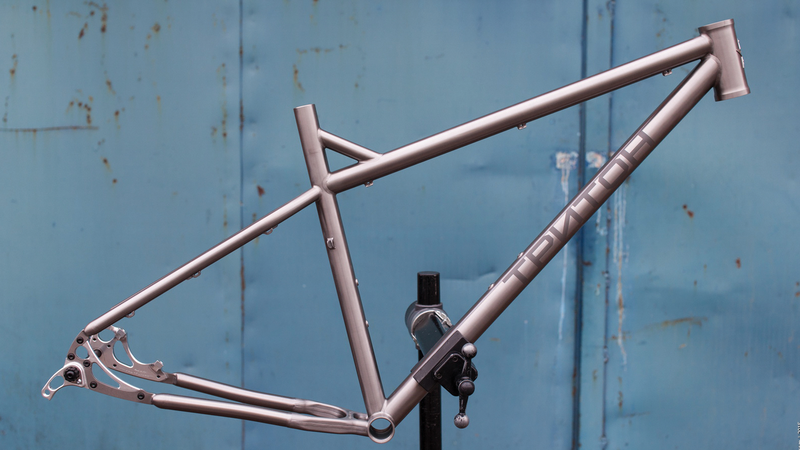 This yoke is a part of the bicycle’s titanium frame that connects the rear chainstays and the bottom bracket. Triton let CML AT know that the part should be capable of withstanding a load equal to 130 kg. Triton also wanted to reduce the weight of the bracket, increase its strength, simplify the production technology, and reduce cost. In order to design this part, CML AT knew that it would have to bring in a partner who was an expert in design and optimization tools. CML AT contacted CompMechLab, an engineering center and expert in design, optimization, and simulation tools, and requested a partnership for the project. 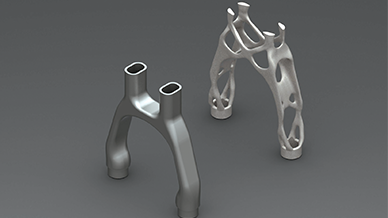 Increase performance, decrease the overall weight, and simplify manufacturability of a custom bike rear yoke using 3D metal printing. Concept generation with Altair Inspire and manufacturing with Arcam machine to produce a lighter weight rear bike yoke that is significantly easier to manufacture. "The redesign resulted in a 48% weight reduction in the part." 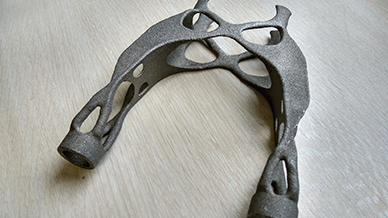 The team at CompMechLab set out to redesign the part for additive manufacturing. 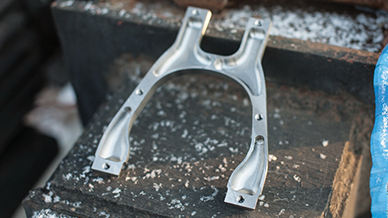 The team knew that it could likely use the current part and with the freedom of additive manufacturing simply print the current geometry, however, it wanted to truly attain all of the benefits of the process and knew it could use Altair Inspire to achieve these benefits. CompMechLab used Altair Inspire to apply all of the loads, shape, and boundary conditions and ran multiple rounds of optimization on the part. Mikhail noted, “In total the whole redesign process of the part took less than a couple of weeks. 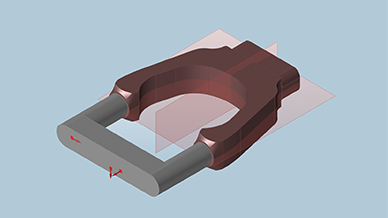 Altair Inspire definitely helped to expedite this process.” After the team had determined the final design for the part, they ran FEA analysis to ensure that it would meet all of the required loads. Once the design was complete and verified, CML AT organized 3D printing and post-processing of the prototype. Electron beam melting technology by Arcam allowed the production of the part in Ti6Al4V within a very short time frame. CML AT is now responsible for all future production cooperation, as well as technical support for Triton Bikes. While the original part weighed 198g and was produced with a very timely and wasteful process, the new part weighs in at 102g and can be produced in a single-step with very little waste. In total, with the new process and design, the part can be produced in two hours. The redesign of the part was extremely successful, Triton is currently working on finishing up the integration of the new design into their customized bike frame. In the future the team at Triton, with the help of CML AT and CompMechLab may also explore redesigning the frame’s front yoke, as well as some of the frame's structural nodes.